I’m already sorry for saying that headline. You’re probably just as sick, as I am, of hearing it in EVERY ABC commercial break (that’s especially a lot if you’ve been watching the NBA Playoffs). Anyway, I’m here to recap the first episode for you with more snark and sarcasm then you ever knew you wanted! Here. We. Go! 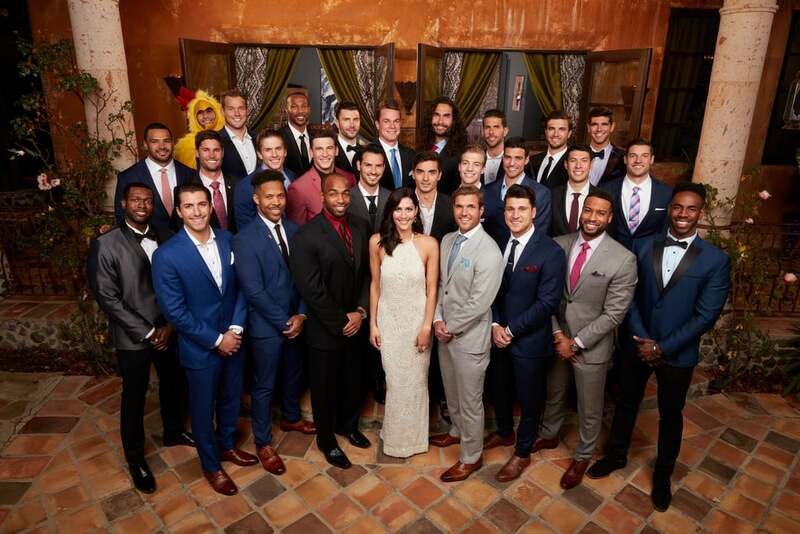 In case you are the small part of the population who is tuning in for the VERY FIRST TIME, and you also managed to miss the world’s worst breakup on every social media platform…Becca is our Bachelorette. She was Arie’s pick on the Bachelor, and then he brought a camera crew to her house to tell her that he wanted to reconcile with second-place Lauren, aka Emily’s literal clone. Don’t @ me, they are identical! For those who don’t know, Arie was a contestant on Emily’s season of the Bachelorette and she rejected him when he got to the final two. These contestants have all been with each other, one way or another. Also, if you are part of the soulless few who are rooting for Arie and Emily, Jr., Arie recently said he and Lauren will be getting married in JanuLARIE (I hate him), and it won’t be on TV. Good. No one cares. You’re a jerk, Arie. Becca is SO READY! So BRING. ON. THE. MEN! After, of course she gets blinded by Kaitlyn’s, Jojo’s, and Rachel’s engagement rings… I mean, after she gets some advice from three women who have already done this crazy thing where they get rejected and then ABC casts 25-ish eligible bachelors(?). There are usually one or two who are not eligible or bachelors. Rachel sages the house, and they all cheers to “Let’s Do the Damn Thing”. Don’t make that quote a drinking game. Just don’t. They introduced a bunch of the guys, but I fast forwarded through it because ain’t nobody got time to meet these idiots twice. So, thirty minutes in we are actually going to see guys arrive at the house. Finally. Colton – She likes him. She thinks he is very handsome. Watches him walk back into the house like he is the last man on earth. Jean Blanc – Tries to teach her some French but it does not work out very well. I also do not believe this is his real name. Jordan – A very awkward thing happens here. He gets out of the car, smiles, she says hi or how are you or whatever, and there is this weird pause like his hard drive needs to reboot and he’s waiting for google to tell him what to say. Also, he’s a male model. Garrett – Drives up in a minivan and proceeds to lead Becca over to the van and show her his balls. His soccer balls. And I assume they named their future children. Lincoln – Lincoln brings cake. He’d win my first impression rose. Kamil – This guy is everyone’s least favorite coworker. I mean that honestly. He’s a social media participant so literally all of us work with him whether we want to or not. He also says something about relationships being 60-40, and tries to get Becca to come to him and she stands her ground. Jake – She knows him from home, and is very uneasy about him being there. Manbun – I don’t actually know his name, and he is in my notes as Manbun so that’s what you get. He arrives with a life-sized portrait of Arie… please see above note, sir. Choir Chris – Tells Becca his grandparents were married after two months, and 50-some years later they are still married. He also unloads a choir out of his limo and has them sing to her while he goes inside. It’s always so hard to tell you what’s happening on this show. We get like 30-second snippets of these guys doing their absolute worst. I don’t trust a single one of them, yet. And there is very little drama to laugh at (don’t fret, it’s coming later this season!). Chase is maybe the closest thing to drama that we are getting. Choir Chris knows one of Chase’s ex-girlfriends and she said via text message that Chase is not here for the right reasons. So, the right thing to do is pull him aside and ask him. Chase’s story is that Danielle is a jaded ex whom he only dated for like a month, and he’s only here for Becca. Chase immediately tells Becca the whole story, pulls Chris in to clarify the context of the text, and clarifies that he’s here for her. This spurs Becca to pull Jake aside. She knows Jake from home, they run in the same circle of friends and he’s never expressed interest. He says they met at the Christmas party, she says they met before that, he says he doesn’t remember meeting her. She’s trying to really nicely tell him that she’s not that into him, and he’s not taking it well. So, he has a few things to get off his chest, he’s had a very transformative year, and if they met in a bar tomorrow things would play out differently, but she tells him it’s still a no for her and he finally concedes, tucks his tail, and leaves. Jake also wasn’t wearing socks, so Boy, Bye! Garret teaches her to fly-fish and she says he reminds her of home. That sounds like a first impression rose if I’ve ever heard one. And. He. Gets. It. When Kaitlyn, Jojo, and Rachel were giving her advice and flaunting their rocks, they told her that all three of them ultimately picked the guys they gave the first impression roses and kissed the first night. Garrett is the front-runner and we’ll have to see how this plays out. Lincoln – he brought her cake, of course he gets to stay. Christon – He’s a former Harlem Globetrotter. John – He made Venmo. I’m not kidding. Ryan – Ryan’s jacket is made from a terrible floral upholstery. Ryan, your aunt wants her curtains back! Colton – He runs a nonprofit. How hasn’t he already made babies with someone? David – He’s in a chicken suit. Manbun – I want someone to cut it off, watch UnReal for examples. LAST ROSE IN CASE YOU DONT KNOW!!!! Kamil is that one guy who’s already too attached, and probably had too much to drink, and is sleep deprived as they walk outside into the sunrise! Chase also thinks he got the short end of the stick. We will not miss either of them. Looking forward, there are lots of smiles, a lot of L-words, and someone Arie’s her. F*CK YES! Jordan is just here to promote his modeling career, Colton’s a virgin and no one believes him. THERE’S AN AMBULANCE!!! Buckle Up, I already hate this season! Next week I will watch on time and suggest a Rosé for your viewing pleasure. Follow me on the twitter @PablogJuan for live tweets during the episode! See you next week! !